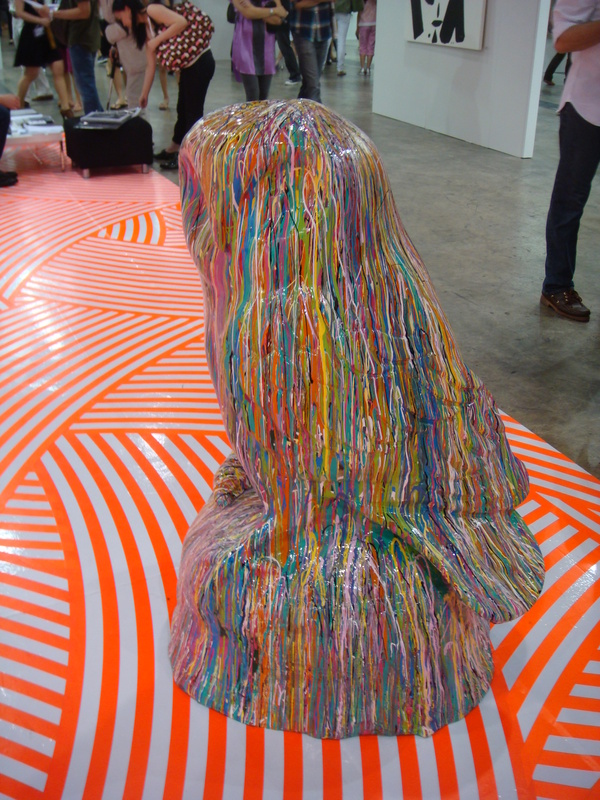 This weekend, I stopped by the Art HK 10 fair at the convention center. 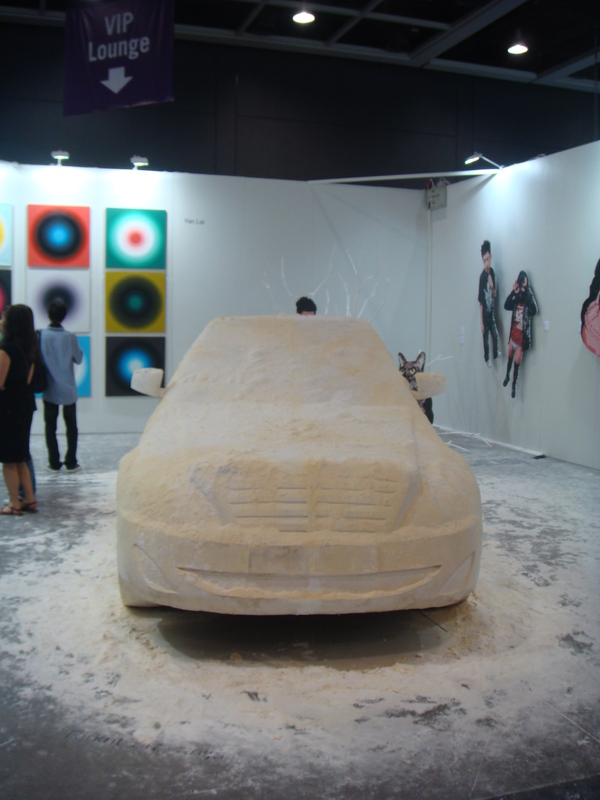 It is an annual 4 day event, showcasing pieces from modern and contemporary art galleries all over Asia. The pieces ranged from $1000USD to $10 million USD. Though I reckon most people were just there to absorb the cultural atmosphere, which is soarly lacking in Hong Kong. This interactive piece is a glass platform that viewers are invited to stand upon. Taking a closer look, this platform is supported tonnes by identical little figurines with their hands raised above their heads. Maybe it is demonstrating the power of the many? It is pretty cool. On a side note, I’ve still not managed to get the mark off my shoes, but from a distance it still looks pretty! Sweet and simple. Though I’m not sure I’d want it in my apartment. Maybe a restaurant. 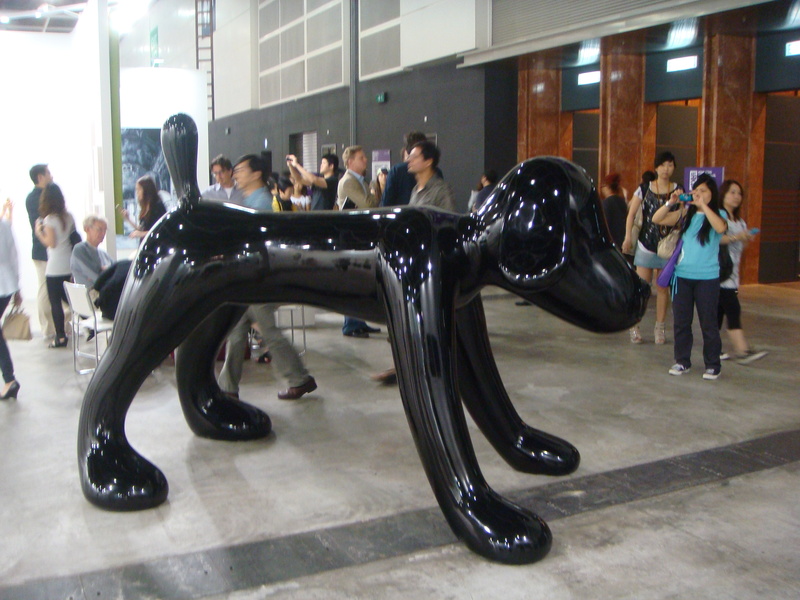 A plastic black dog at the entrance. See all those cameras in the background? It really wasn’t just me! Can you see the owl? The stripes of color also reminds me Paul Smith! A rather disturbing bronze sculpture of Mickey Mouse/Jesus Christ. The only thing that would make it even more disturbing is if the water squirting out of the body was blood red. I wonder what the artist is trying to say…….. that Mickey is humanity’s new salvation? Or perhaps it is another message about society’s idolization of pop culture taking over good old Christian faith. I just cant get over how smart and neat this armor/dress made of Chinese ceramics is! Can you see the bowls and plates? To top it off, this is a well made dress with a design too. There’s a defined bodice, a waist and little frills at the hem. Isn’t it absolutely awesome? Stay tune for more on the exhibit later this week! Wow. the Micky/Jesus sculpture is chillingly powerful. Wow, pretty much every artwork you have posted has sent a little thrill (or a chill) down my spine.